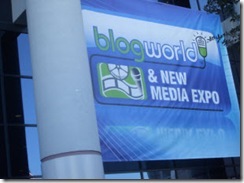 Several weeks ago, I had the honour of being a speaker at BlogWorld in Las Vegas. Picking up my badge in the Speakerâ€™s Line at Registration early Thursday morning, a few eyebrows were raised when I was asked if, indeed, I was a speaker. 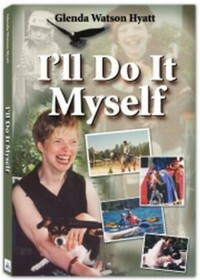 A few short years ago, me, given my significant speech impairment due to my cerebral palsy, speaking at a large conference was Impossible. But, with advances in technology, creativity, determination, and a patient and understanding audience, the impossible became possible! That speakerâ€™s badge for the conference of the blogging industry represents a huge milestone in my story â€œLove at First Sound Byte: A Womanâ€™s Journey from Being Labeled Non-Verbal to Being a Well-Sought-After Speakerâ€ (potentially the title for my next book?). 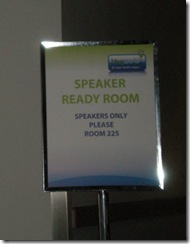 Shortly before my presentation time, I checked in at the Speaker Ready Room â€“ another sign that the impossible was now possible. I didnâ€™t hang around in there though. I thought being in the same room as superstar speakers might cause me to panic even more; I was already feeling my athetoid cerebral palsy kicking in as my body began tightening. 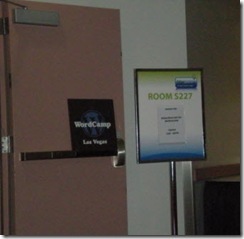 Rather, I headed to the room where WordCamp Las Vegas was now being held. The last minute room change was one of many glitches to befall my panel presentation. Actually, I wanted to catch the panel with Chris Garrett, Darren Rowse and Jeremy Wright. 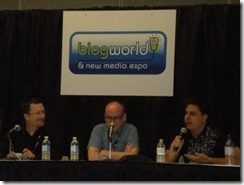 Even though Chris and Darren had written the very successful ProBlogger: Secrets for Blogging Your Way to a Six-Figure Income, this was the first time they had presented together on the same stage. When i first read ProBlogger, I had goose bumps reading how Chris and Darren both got started with blogging and how they turned it into a substantial income source in their own ways. They are what I would like to be when I become a grown-up blogger. Once on stage â€“ after a glitch with the stage lift and a technical glitch with the sound system â€“ my co-panelist Damien Patton introduced our session and then kindly introduced me. 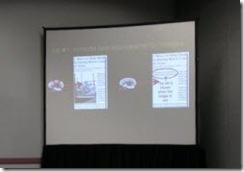 As soon as I began my PowerPoint presentation, I realized the headings on the top and the captions on the bottom of the slides were cut off; apparently a glitch with the projectorâ€™s resolution. 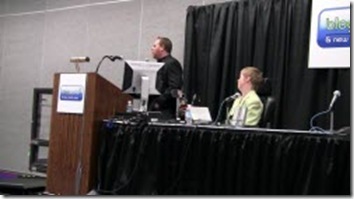 Here I am about to present on accessibility and one of my key accessibility features (i.e. captions, which took days to create) was not working. How annoying and frustrating! But, in the moment, I could not do anything except to carry on â€“ without captions. With all of the glitches and being star-strucked, I was not in the most relaxed state. My athetoid cp was in full force. From my side of the stage, I am sure I out spazâ€™d and out grimaced actor/Parkinsonâ€™s advocate Michael J. Fox and cerebral palsy comedian Josh Blue combined. Somehow my twenty-five minute presentation ballooned to thirty-seven, leaving Damien mere seconds to give his presentation. However, a few years ago, the thought of me giving a thirty-seven minute presentation was inconceivable; impossible. In the process of making the impossible a possibility, it isnâ€™t always perfect, it isnâ€™t always pretty. The key is to do! Closing in on perfection and prettiness will come from lessons learned and from refining the process. Compared to this presentation, the next one will be a breeze! To read my presentation as an free ebook, check out How POUR is Your Blog? 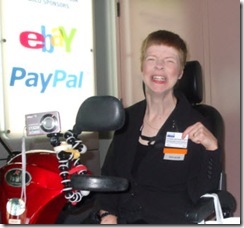 Tips for Increasing Your Blog Accessibility. What an exciting rendition of butterflies on the way to greatness. Sounds like you handled it as smoothly as possible. Glad to read this today because I have been thinking of you and if you did speaking engagements. I have an interview opportunity for you if you want to email me on it I will send you the info. Sometimes life seems so hard, and other times it is so invigorating and exciting. Seems you have been experiencing the latter! I just loved this post.